A Killer Whale pod has grouped together at sunset and enjoys some quiet time while resting on the surface of the water off Northern Vancouver Island in British Columbia, Canada. A spectacular sunset colors the sky over the waters off Northern Vancouver Island in British Columbia, Canada as a pod of Killer Whales reunite for some resting. As the pod remains close, the dorsal fin on the only male is very prominent over the females as the sunset lighting reflects off the surface of the calm water. The bright yellow lighting shines through the mist lingering in the air from the blows coming from the pod. Each pod in the Northern Residents is identified by a letter and every Killer Whale in each pod has a number attached to it. This identification process took decades to complete and was started by a man named Michael Biggs. Before his death, he had laid out a lot of the groundwork for these studies along with close working partners John Ford, Graeme Ellis and Kenneth Balcomb. A family or pod of Killer Whales will travel together throughout their entire life with the oldest female being the matriarch. Pods can vary in sizes depending on how many children the matriarch has and the continuation of new Killer Whales as her children have babies. The crew of the whale watching tours off Northern Vancouver Island can easily identify each whale and inform passengers of their family members and history around Northern Vancouver Island. 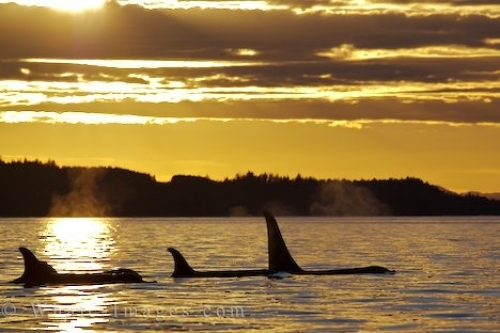 The best time to view the Killer Whales off Northern Vancouver Island is anywhere from June to October when they return to these waters following their main source of food, the salmon. Passengers who are lucky enough to encounter a Killer Whale pod in the beauty of a sunset will always remember this experience.